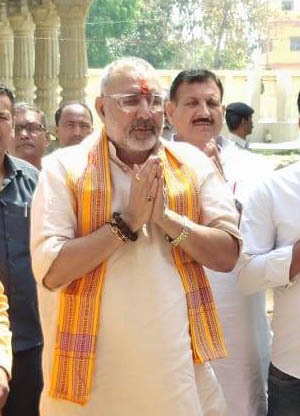 Patna, April 5: A case was filed on Friday at a court in Bihar's Begusarai against Union Minister Giriraj Singh for making a casteist remark against a Congress MLA. Besides Singh, the case filed by Rashtriya Lok Samta Party leader Rajiv Kumar, also named Mahant Shankar Das of the Suja Thakurbari as an accused for the remark against Begusarai Congress MLA Amita Bhushan. According to the petitioner, the remark was initially made by Shankar which was later supported by Singh during campaigning. The Bharatiya Janata Party has fielded the Minister from Begusarai for the Lok Sabha polls. The petitioner's lawyer Prabhakar Kumar Sharma said the Chief Judicial Magistrate court will hear the case again on April 11.